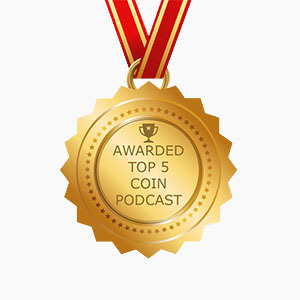 On This Episode of The Coin Show Mike and Matt answer a listener question, talk about The Coolest Thing To Walk Into Matt’s Shop and discuss the news in the world of numismatics. So happy to have you guys back on the air again. Love listening to your show when Im out walking and because you are so entertaining and knowledgable I have gone back and listened to every podcast. Great ideas and I learn something new on each episode. I appreciate what you bring to the hobby so thank you again and knowing you don’t get paid to do these podcasts I understand it is a major commitment from both of you so once again thank you for enhancing our hobby and educating all of us!!!!! PS.. I live in Kansas and will be attending my first ANA show this summer in Chicago because of everything I have learned about the ANA and other events from listening to both of you. Thanks for making me learn and laugh every time I listen. Who knows, maybe that ‘thumb tack’ Co. (and you’re other ‘sponsors’) have advertising budgets and eventually you CAN get paid! Maybe produce and sell your shows to large city radio markets, before and during the big coin shows? Just a thought from a retired radio DJ. Great stuff. I think I’ve listened to every episode. I would love to hear your thoughts on the mint’s Apollo 11 coins.